With Christmas fast approaching I thought this was a great looking Off Road truck for your money.. 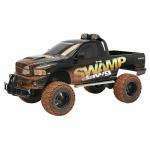 The New Bright Swamp Dawg is a fully functional radio control Dodge Ram with steering. The vehicle features off-road tyres on deep dish rims, high rise off-road chassis and front bull bars. Batteries included. Age range 8yrs+. Has great chunky tyres, and suspension, and most important of all for parent a rechargable battery pack.It was never worth £100, that's nearing Tamiya quality, but for £50 it's a great big (actually massive!) box present for the child in your life, big or small! This is a radio control truck! haha that's not a radio control truckThis is a radio control truck! Same price in store at Asda also. You ain't kidding! and I bet it's well fast, but then again, I bet it's a lot more than £50. yea it's £800 ish, but it's a beastRuns on unleaded too. Forgot to add that they also had a slightly cheaper Truck & Jeep, also massive @ 1:10 scale, and also half price, were £60, now £30, didn't think it was worth posting these as a seperate deal though.. This truck will be really slow, Bought something similar from Tesco a couple of years ago and it was to underpowered to be enjoyable....even for a 10 year old. This is similar and made by the same company...absolute pants. This truck will be really slow, Bought something similar from Tesco a … This truck will be really slow, Bought something similar from Tesco a couple of years ago and it was to underpowered to be enjoyable....even for a 10 year old. Sorry didn't make myself clear anough...I have had RC cars and trucks from other shops like toys'R'us for £20-40 that have twice the power of the carp sold in Tescos. I don't keep mine in my front room mate but good attempt. Mire Mare are you having a conversation with yourself on this thread?